Calvert Crossing is a private country club located in Calvert Estates community. At the center of the club, is the 18-hole championship golf course co-designed by John Floyd (who worked under Jack Nicklaus) and Bill Zimmerebner. 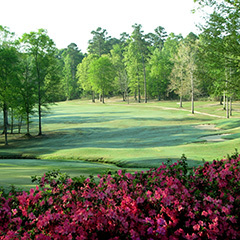 This modern design, carved throughout the rolling hills of the West Ouachita Parish region, is considered by many as a beautiful and peaceful “walk in the woods.” The manicured fairways are lined with towering and mature hardwoods and pine trees and the undulating greens provide a variety of hole locations. In addition to golf, Calvert Crossing offers a fully stocked golf shop, pub-style restaurant, banquet facility, tennis courts and outdoor swimming facility.